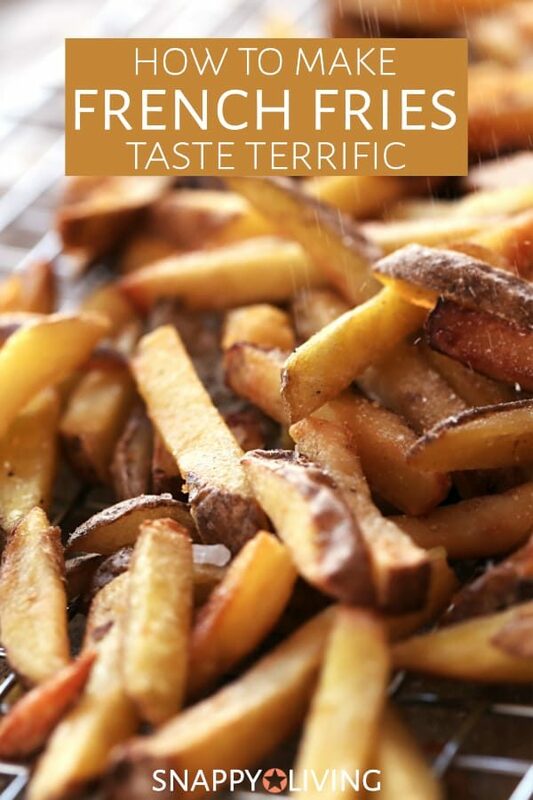 Homemade french fries aren’t the easiest dish to make. But they taste amazing, and you can experiment to find your ideal recipe. If you’re wondering how to make French Fries great, read on. Bobby Flay agrees with me about a couple of things. If you use oil, the oil to use is peanut oil. And soaking the fries before you cook them is key to keeping them crisp. Soaking gets rid of some of the starches and sugars that prevent fries from cooking up golden and crisp. Of course, if you like them soft and a bit on the oily side (which is especially good if you leave the skins on), don’t soak them. Use Idaho or Russet potatoes. They fry the best. Never freeze potatoes. Grocery stores have developed the appalling (but cheap and convenient?) habit of freezing and/or refrigerating potatoes. That turns them sweet. Buy potatoes from a local farmer or a grocery store that stores them correctly. At home, potatoes should be stored in the dark at room temperature or slightly cooler. Basements are ideal, but a kitchen cabinet will work too. Soak them for about half an hour in cold tap water. Some people recommend ice water. Then remove them and pat them dry. Leaving the skins on is a matter of taste preference. But the skins are where many of the nutrients are found, so leaving them on means more Vitamin B-6. If you do leave them on, clean the skins thoroughly with a scrub brush. This is just good practice with vegetable skins in general. Skins are usually where the best nutrients will be found, but also where bacteria tend to live. Lard, not oil, actually produces the best-tasting fries. Yes, I said lard. Recent studies show that saturated fat isn’t bad for cholesterol or heart unless you eat way too much. I rarely eat fries, so I figure they should taste good when I do. Heat the oil to 350 degrees, or a little bit less. If your oil starts smoking, it’s turning into trans-fat. Just turn down the temperature a little. As I mentioned above, you can reuse the oil – a few times. Restaurants sometimes keep reusing it until it’s rancid, which is gross, unhealthy and nasty-tasting. After cooking your fries, let the oil cool in the pot. Strain it back into its container through a coffee filter or similar porous material, and then store it in your refrigerator. This is not only a money saver – reused oil can make the next batch taste even better. How many times can you reuse it? There’s no hard and fast answer, but it is easy to tell when it’s gone bad. Cook them in small batches. Dump in a small batch of uncooked fries. Pull them out when they’re as brown as you like. Put them on a paper towel to cool and lose some of their grease. Salt them while they’re still hot. Salt sticks best when they’re still hot. If you prefer them less greasy, you can pat them with another paper towel to blot off some of the excess. I like this method because it makes them crispy. The surface grease adds nothing to the flavor, in my opinion, so why eat it? Some people swear by twice-frying. You cook each little batch of fries until they’re just barely golden, and take them out to dry. After you’ve cooked all batches that way, put them in again until they’re nice and golden/brown (however brown you like them). I was always very happy with the results of just frying them once, but why not try both approaches and see what you prefer? Never store potatoes in a plastic bag (which is how most are sold nowadays). Either put them in a paper bag or some kind of bin. The moisture they give off will collect in the plastic bag and cause them to rot. Also, don’t store them near onions, which give off a gas that also can promote potato rot.